I don’t know about you but I feel relieved when the holidays are done with. Don’t get me wrong I look forward to the holidays every year, but I always have a tendency to over indulge on all the goodies that are around. I have a bit of a sweet tooth, so I love all the cookies and candies that are in the house and find myself eating them when I know that I shouldn’t. So once the holidays are over it is always nice to get back to eating a little less and hopefully a little healthier. I made a simple egg skillet the other day. I love the combination of potatoes, eggs, and bacon; I had some broccoli in the fridge so I threw some of that into this skillet dish too. It turned out to be a delicious combination; I like the flavor that the broccoli added to this dish. I shared it with the hubby, who enjoyed it as much as I did. 1. 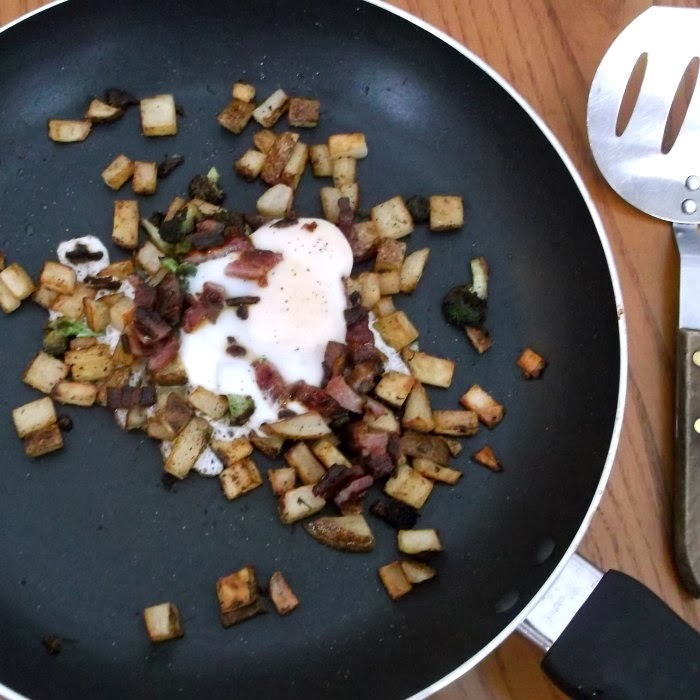 In a medium skillet fry the bacon until crispy. Remove and set aside on a paper towel. 2. While the bacon is frying, scrub a small potato. Dry and cut the potato into small cubes. 3. Chop broccoli and set aside. 4. Once the bacon is removed from the skillet remove excess bacon grease, leaving about 2 tablespoons in the skillet. 5. Add the cubed potatoes and the chopped broccoli cook until tender about 10 minutes (it will depend on the size of your potatoes for cooking time). 6. Once the vegetables are tender crack and egg on top of everything. Cover and cook the egg until desired doneness. 7. Once the egg is just about done crumble bacon over top of the egg and vegetables. Salt and pepper to taste. Simple food is where it’s at over here now. 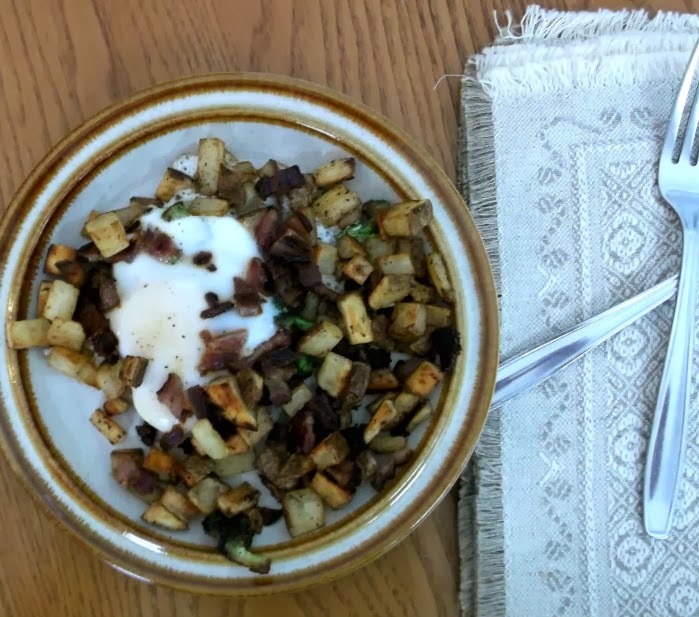 Love this easy breakfast skillet! 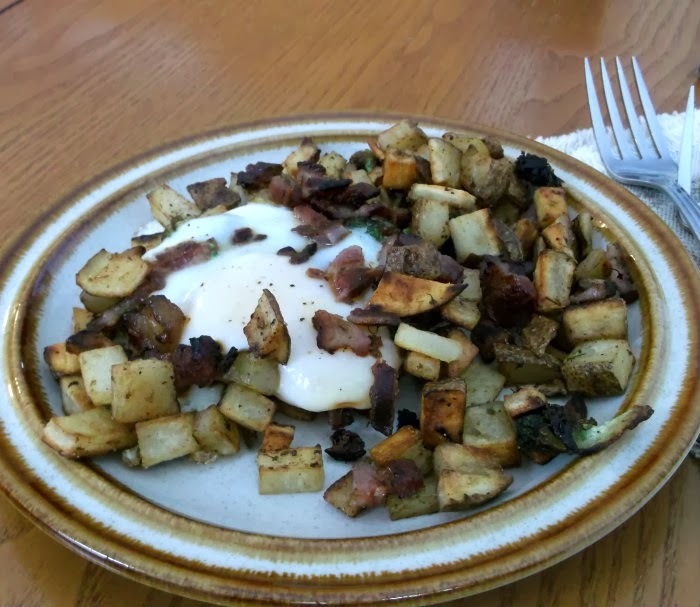 There’s a restaurant near me that specializes in these kinds of skillets, always starting with potatoes and building layers of different options from there. I love the idea of making one myself. I always look forward to January, too. I love all the rich food we eat basically nonstop between Thanksgiving and New Year’s, but enough is enough! This looks great – thanks.